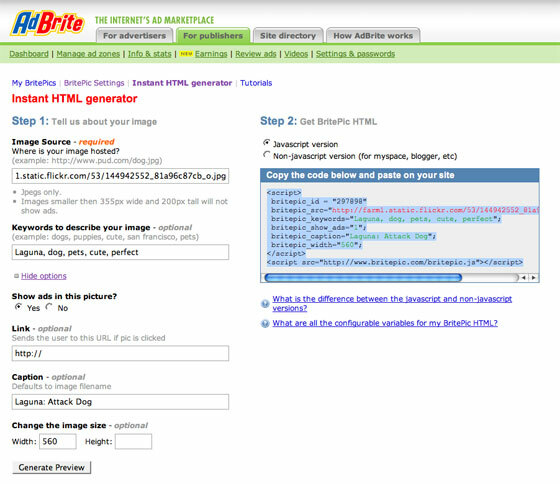 The basic format for embedding images into a web page using the <img> tag has been around almost as long at HTML itself, since the first graphical web browser. It works, and it is used constantly. But can it be better? Advertising network AdBrite, which is always looking for new ways to think about things, says it can. This morning, AdBrite launches BritePic to help people add a lot of new functionality around embedded images. Just by changing the embed code, web publishers can add a caption, watermark, zoom, share, resize and other features. And an advertisement, if they choose to. Any of the parameters can be changed above. When you register with BritePic you add a watermark and payment information if you choose to include advertisements in pictures. The id in the code above tells it what watermark to add. BritePic doesn’t host image files, so the src field tells it where to pull the image from. Keywords can be added (future functionality will show related pictures), adds shown or not, a caption added, and the width reset. There are also a number of features in the pull up menu at the bottom left of the image above. Zoom is my favorite. Zoom in on a picture and see a larger version of that area. If you are using a large image and resizing, there will be less pixelation. But even for non-resized images the zoom feature could come in handy. On this blog, where we are limited in the horizontal space allowed for images, it will allow us to upload larger images and allow people to zoom in, or simply click to see the larger image on a new page. The company has created a demo video, which we’ve embedded below. AdBrite was founded by Philip Kaplan and Gidon Wise. Background information on the company is here.